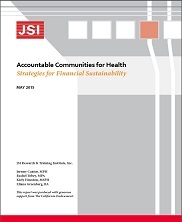 The concept of Accountable Communities for Health (ACH) has been gaining momentum in California and nationally as a leading-edge approach to realizing ambitious community-level health improvements and achieving the Triple Aim (higher quality care, reduced cost, improved health). An ACH is a partnerships between private, public, and community organizations who collectively commit to improving health in a geographic area. By developing a comprehensive portfolio of clinical, social service, linkage, and policy/system/environment strategies, an ACH seeks to improve the health of the entire community, with particular attention to priority health conditions and achieving greater health equity. However, in order to be brought to scale and achieve long-term goals, an ACH will need to secure financial support from multiple payers for services, programs, and partnership functions. The report lays out principles and strategies for achieving such multi-payer support. Jeremy Cantor, Rachel Tobey, Kiely Houston, Eliana Greenberg. John Snow, Inc. 2015.